The Wine Advocate - While not as concentrated or monumental as this estates 1989, the 2005 is a fleshy, racy, hypothetical blend of the 1994 and 1998 Haut-Brion, only better. It boasts a gorgeous perfume of citrus oil, lime, honeyed grapefruit, flowers, spicy smoke, and earth, followed by terrific definition, purity, and full-bodied power, but it is not as masculine as its closest competitor, Laville Haut-Brion. The 2005 Haut-Brion will be approachable early, but it should age well for 30-40 years. Wine Spectator - Intense aromas of apple, lime and mineral follow through to a full-bodied palate, with incredible power. Electrifying. It touches all of your tastes buds. Dense yet refined and elegant. This may be the best ever. Parker - While not as concentrated or monumental as this estate’s 1989, the 2005 is a fleshy, racy, hypothetical blend of the 1994 and 1998 Haut-Brion, only better. It boasts a gorgeous perfume of citrus oil, lime, honeyed grapefruit, flowers, spicy smoke, and earth, followed by terrific definition, purity, and full-bodied power, but it is not as masculine as its closest competitor, Laville Haut-Brion. 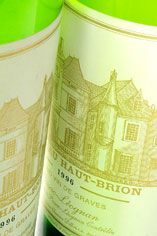 The 2005 Haut-Brion will be approachable early, but it should age well for 30-40 years. 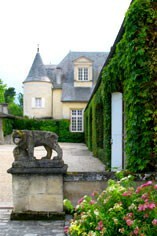 Chateau Haut Brion is located in the bustling suburb of Pessac on the outskirts of Bordeaux, this 45-hectare 1er Cru Classé property was the only property outside of the Médoc and Sauternes to be included in the 1855 Classifcation. The vineyards (Red: Cabernet Sauvignon 45%; Merlot 37%; Cabernet Franc 18%; White: Semillon 63%; Sauvignon Blanc 37%) lie on large (up to 18 metres deep in places) gravel banks interspersed with clay. Jean-Bernard Delmas, one of Bordeaux`s great characters, has been régisseur since 1961 and the wine-making is now overseen by Jean-Philippe Masclef. Haut Brion is characterised by its seductive perfume, harmony, elegance and its ability to age with grace and dignity. A superb white is also produced.